You know those signs, the ones that say "I love cooking with wine, sometimes I even put it in the food" ? That is how I felt making this savory dish! Because I, like many of you, don't want to splurge $30 for a filet, we got New York Strip steaks because they were on sale. Obviously this portion of meat is bigger than 4 oz. so I made sure to only eat half! Which was actually awesome because I took the leftovers for lunch the next day:) We also made sure to trim the fat off of the meat before cooking. I really enjoyed this meal. It's nice to have steak once in awhile and the red wine sauce is pretty good. I could have gone without the cornmeal on the veggies, the added taste and texture didn't do much for me. So, if you're looking to cut calories don't bother dusting the veggies with cornmeal. 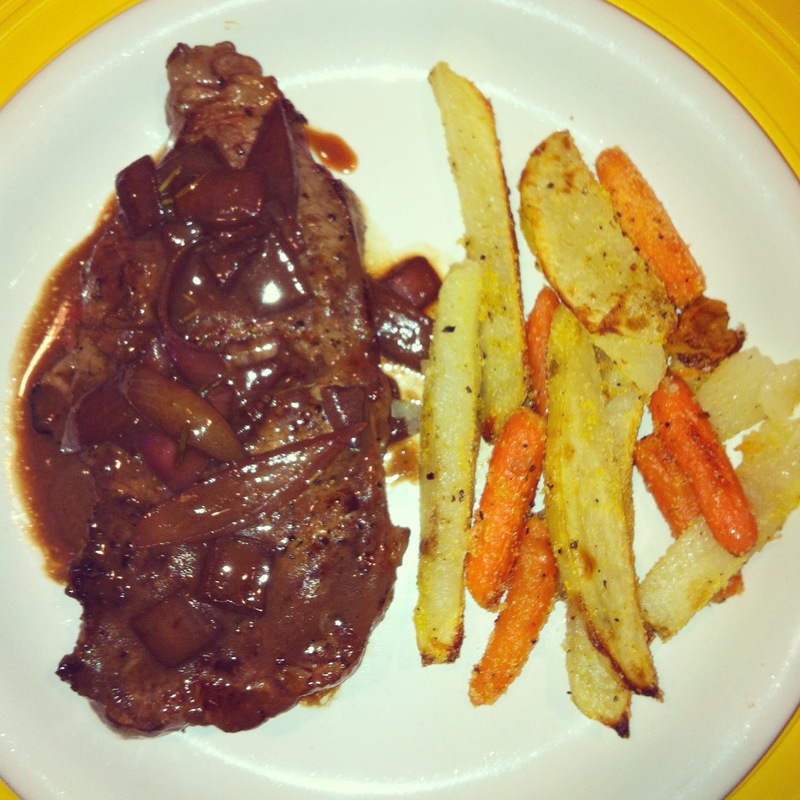 There are a handful of Ingredients and steps to follow so instead of listing them out for you, just click this link for the full Cooking Light Beef Filets with Red Wine Sauce recipe.